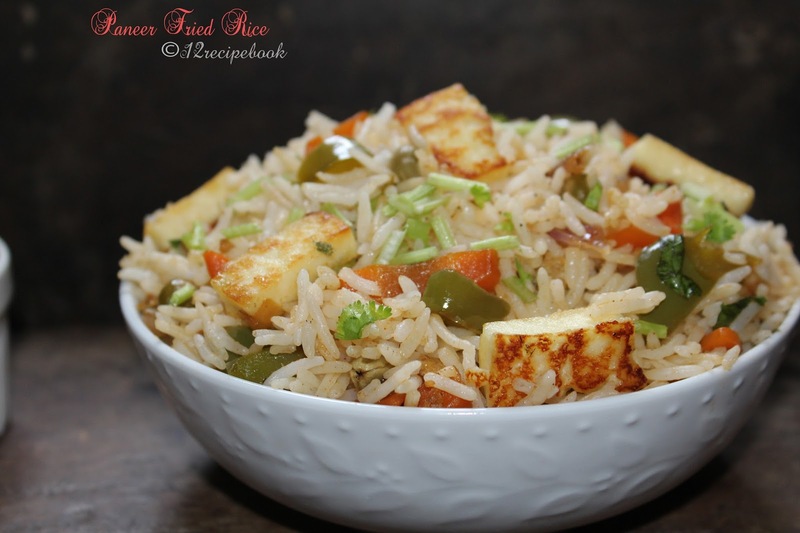 Paneer fried rice is a tasty, nutritious, colorful and affordable rice preparation for most of all. Add any veggies of your choice to make it more colorful and yum. Also avoid the one which you don't want. Making home made paneer is a simple process. 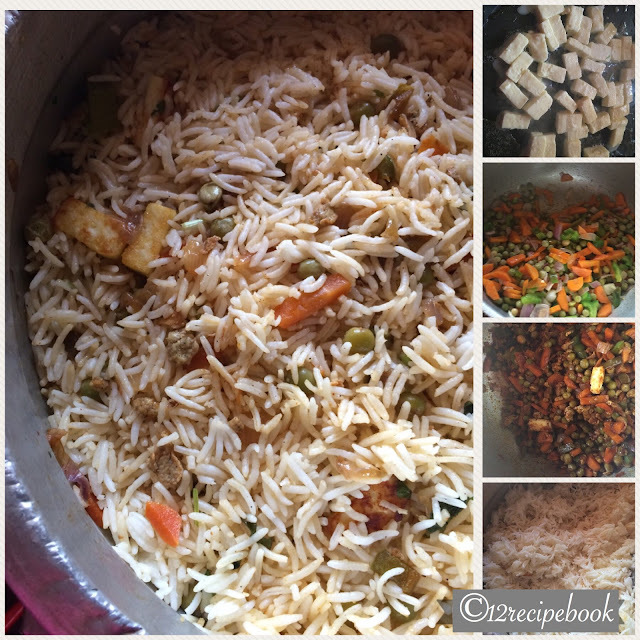 Do check out my PANEER preparation. Soak the basmati rice in water for 1 hour. Cook it with enough water and salt and drain (u can also cook it by making ghee rice method with 1 ½ cup of water; then no need to drain but after cools down completely; separate the rice well.). keep aside. Heat a tablespoon of ghee in a non-stick pan and fry the paneer cubes on both sides for few minutes until nice golden. Take it out and keep aside. Stir fry the eggs in little oil with salt and pepper powder; keep it aside. Heat butter or oil in a pan ,add chopped carrots, sauté for a minute. Add green peas, spring onion, capsicum, pepper powder, soya sauce, chilly sauce, tomato sauce, stir fried eggs and salt. Cook for 5 minutes. 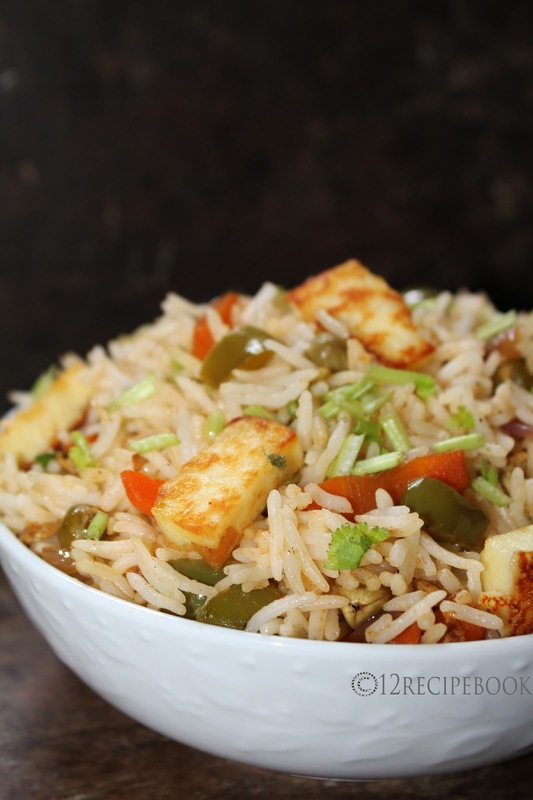 Add cooked rice and fried paneer cubes in to it and mix gently for 5 minutes. Switch off the flame, garnish with coriander leaves; and serve hot with tomato ketchup or the choice of your side dish. You can first prepare ghee rice instead of drained basmati rice and then mix it with veggies. Then it will be more delicious.